Skiáthos, the most cosmopolitan island in the Northern Sporades, is truly a paradise on earth, with lush pine forests and crystal-clear azure waters. Despite the rapid growth in tourism here in recent decades, it the island is still picturesque and unspoilt and blessed with more than 60 beautifully clean beaches. The most famous is Koukounariés, which has been declared the third most beautiful beach in the Mediterranean. When you add in its bustling nightlife, it is only natural that the island attracts thousands of young visitors every year. Whether you want to hide yourself away from the crowds or dance until you drop – and then wake up and do it all over again –, Skiáthos, with its delirious night life, is a real treat for visitors and especially for young people seeking the freedom to ignore conventions and party on to the frenetic beats of their favourite music! The pedestrianised street by the Old Harbour is the ultimate hotspot for entertainment! Buzzing bars and clubs keep youngsters rocking through the night and until the early morning! The party continues in the area of Ammoudiá (on the road to the airport) where entertainment addicts celebrate in big open air clubs! Colourful cultural events, concerts and art exhibitions held throughout summer add a special touch to holidays on the island! 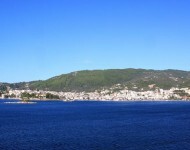 The capital town of Skiáthos, the biggest settlement on the island, is a modern resort with excellent tourist facilities. The town is relatively new. It is generally assumed to have been built around 1829-30 on the same site as an older town. The town’s most important landmark is its natural harbour, which has determined the destiny of the town for centuries. Today it is a popular yacht and sailing boat haven that adds a cosmopolitan flair to the island. A stroll around the town’s paved streets reveals cute white houses with red tiled roofs and colourful gardens. The picturesque harbour surrounded by four small islets is a sight not to be forgotten. Don’t pass up the chance to visit Boúrtzi, a small peninsula with lush vegetation where the ruins of a Venetian fortress still stand. The fortress was established in 1207 by the Gizi brothers but it was destroyed in 1660 when Admiral Morozini conquered the island. Today it is one of the most romantic spots on Skiáthos thanks to its densely planted pine trees and stunning views of the archipelago. Apart from Bourtzi don’t miss the opportunity to visit the former house and now museum of the famous author Alexandros Papadiamantis (who is commemorated every year with special celebrations on 3-4 January and on the 4th of March) who was born and raised on the island. There is also the Church of the Annunciation of the Virgin Mary with its four museums and Kástro (meaning castle), a natural fortress that was used by the inhabitants in the 14th century as a refugee against pirate raids. Today Kástro attracts many visitors thanks to its breathtaking natural beauty. The island has 60 superb beaches, among which Koukounariés or Golden Sand in the southwestern part of the island stands out. Koukounariés beach is also famous for its lush pine forest- whose needles “touch” the water offering unique natural shade- and Strofiliá, a rare wetland nestling amidst the pine forest, which has been declared a protected area due to its enormous ecological value. here are also plenty of tavernas and lively cafes and bars. If you like, you can also rent a boat, play tennis at one of the local hotels’ tennis courts or try out some exhilarating sea activities! Meyáli Ámmos, on the road to Koukounaries and Ahladiés, is a popular beach with crystal clear waters and picture-perfect tavernas by the sea.